Rose's role Tuesday a sign of things to come? 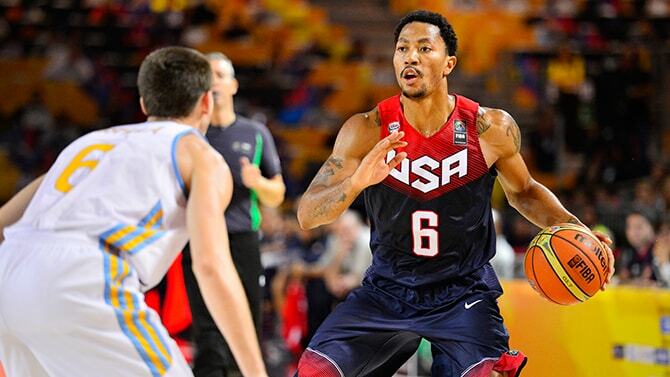 It’s been a curious couple of days for Rose after a scoreless game in a 23-point USA win over Mexico Saturday. Rose played only four minutes in the first half, and when he came into the game in the second half the USA lead was substantial. So he worked to get other players involved and scoring. Like a point guard should. You know, make the right play, play the right way. Heard that one before? Then everyone wanted to know—again!—what was wrong with Derrick Rose. And this time even his coach. Rose wondered why as the point of the game is to win, the USA was averaging a tournament best 31-point margin in its victories and Rose was playing the supporting role being a bench player suggests. He was fine with all that: Check your ego at the door, win for the USA. Then USA Basketball officials, including coach Mike Krzyzewski, took Rose aside Monday and suggested he look to be a scorer. Forget about passing so much, which is curious since one of the team’s big problems—if you can call it that with huge win margins—is a starting guard corps that appears to be rehearsing for a one-on-one tournament. No one on USA Basketball would say it, but the suspicion is they are concerned about likely finals opponent Spain, which could shut down the team’s biggest scorers, Anthony Davis and Kenneth Faried. Faried had 14 points Tuesday and Davis 13 while Klay Thompson led six players in double figures with 20 points. The concern seems to be no one has emerged as a go to scorer. So Krzyzewski suggested Rose throw his hat, or shots, in the ring. Or rim. Maybe the Duke recruits will remember that one. Coach K said not to pass? Rose demonstrated he can follow orders well from the jump, or at least when he entered with about five minutes left in the first quarter and the USA leading barely at 13-10 with another misfiring, two of 14 start from the starters. Rose immediately drove into the lane with a blazing double crossover move, but had his layup go up too hard and off. He gathered in the loose ball and put it back for a score. After a followup slam dunk from Faried as the USA dominated the boards against the small Slovenia team, Rose then got into the open court and blew by the defense like one of those cars whizzing by you on the Eisenhower at 2 in the morning and finished a layup left handed. Rose missed a pull up three as the USA led 29-22 after one quarter. “I’m kind of used to it (coming off bench),” Rose said as Kyrie Irving appeared to hurt his hip again in a fall, though finished strong. “But at the same time I know when they start the game like they did (behind 8-4), coming off the bench is huge. I have to be huge with my energy, defensively getting into the ball, and just seeing what’s open on the court. Going out there and performing and seeing what the game is missing and just trying to get into the game. It sure looked that way as Rose simple accelerated at a speed no one on the USA team could come close to matching. He was six for 10, but missed both his threes. He did hit a jump shot late in the game. “The speed and explosiveness, we‘ve seen that,” said USA assistant and Bulls coach Tom Thibodeau. “(It was) more like the mindset of attacking. I think he’s gaining confidence. Each and every day getting more confident. Rose returned midway through the second quarter as Thompson, with as pure a stroke as anyone on the USA team, began making threes and finished with four. Rose left a vapor trail blowing in for another score as he also was picking up deep in the back court on defense and helped hold Slovenia and Phoenix Suns star Goran Dragic to 13 points on six of 15 shooting. Rose did have a late turnover losing the ball in traffic as the USA was leading just 49-42 at halftime. Added teammate James Harden, who quipped walking by to the team bus, “That’s exactly what it was” as Rose was being asked if it felt like flipping a switch. The USA, as has been its pattern in this tournament with its pressure defense and frequent substituting, began to wear down the Slovenian players. The USA had a 40-10 margin in points off turnovers and eight in the third quarter when the USA broke open the game. Irving had a big crossover and pull up jumper and a three in transition, Davis rebounded and slammed a Stephen Curry miss and then another on a slick inbounds play and Harden had a nifty look away pass for a Faried dunk. Rose returned with the USA leading 74-54 with 2:23 left in the third quarter and immediately found Thompson in a runout score, passed to Harden for a three, took a bruising hit with no call on a drive and apparently no harm and then sent the USA players jumping off the bench with a devastating crossover for a score and 86-64 USA lead after three quarters. Rose had an unselfish play to drop off an easy dunk to a trailing DeMarcus Cousins for a slam to open the fourth quarter. Cousins repaid with a quick pass to a slashing Rose, who hung and made a layup. Rose then lobbed a pass to Thompson for a dunk and 102-69 lead and added his lone jumper of the game before checking out with the USA ahead 104-71. “Very surprising for me,” Rose conceded about the score mandate from Krzyzewski amidst all the one sided wins. “And coming off the bench, that was a huge thing, too. Because when you come off the bench, your mindset is kind of different. When you’re up 15-20 points, you’re just trying to find holes in the game that you can fix and just try to make the game easier. All my baskets were kind of like in transition, a missed shot, get the ball, rush it down the court and if I see a lane, take it. But people are going to catch onto that and play different. So I just have to adjust and try to make the game easier for everyone, get them in rhythm. So next is Thursday against Lithuania, which defeated Omer Asik and Turkey earlier in the day. No one much thinks Lithuania with NBA players Jonas Valanciunas and Donatas Montiejunas has much chance to stop the USA’s inevitable meeting with Spain in the final. But the USA isn’t likely to have a 23-12 edge on the offensive boards against Spain as it did Tuesday. The USA also had 60 points in the paint in Tuesday’s win. Krzyzewski probably sees that coming. A little bit of that Derrick could help.